Have you decided that running an iOS 8 beta on your iPhone or iPad isn’t such a great idea after all? Understandable, considering the beta releases are fairly buggy, mainly for developer testing, and not intended for prime time usage quite yet, so let’s walk through how to downgrade iOS 8 back to iOS 7. We’ll cover two different methods to go from iOS 8 beta back to iOS 7.1.1. Both will work just fine and you can use whichever you want, though the first method we’ll call the easy way, is typically best for most users. Nonetheless if the first easy approach fails due to an error, we offer a second route that goes through putting the iPhone, iPad, or iPod touch into recovery mode and will certainly work. You will need the latest version of iTunes to be able to perform a downgrade from iOS 8 beta back to a stable iOS build, a Mac or PC to run iTunes on, an internet connection, and a USB cable to connect the iPhone, iPad, or iPod touch with. You will also need to be comfortable with losing whatever is on the device since running iOS 8, this is because an iOS 8 backup cannot be restored to an iOS 7 device. However, you will be able to restore a previously made iOS 7 backup to the device once it’s back on iOS 7 however. This is why it’s so important to create regular backups of your data if you’re going to be beta testing any operating system. You did that, right? The simplest way to downgrade from iOS 8 beta is to use an iOS 7 IPSW file, then simply ‘update’ to that iOS 7 release. This is the same way users manually update iOS with firmware files and it works to downgrade iOS as well. Now that the iPhone or iPad is back on iOS 7 you can choose to restore the device from a prior backup made from iOS 7 to either iTunes or iCloud, otherwise just set up and use the device as new. A quick note: you can also Option+Click on the “Restore” button but you would need to turn off Find My iPhone first, thus we’ll go with the Update option instead, which does not require that. If you can’t get the easy downgrade method to work for whatever reason, you can also pop the device into recovery mode and then restore the device through iTunes. Generally speaking this approach shouldn’t be necessary unless the iOS device is nearly bricked, but it’s good to cover anyway. This sets up the iPhone, iPad, or iPod touch as a brand new device running the latest version of iOS 7. Once finished, you can either continue to use the device as new, or restore from a previously made iOS 7 backup from iTunes or iCloud as described here. Note that restoring from a backup only works if you actually made a backup prior to installing iOS 8. If you run into Error 3194 it’s almost certainly because you have Apple servers blocked or rerouted in your hosts file. This is fairly common for those who have jailbroken an iPhone or iPad before, as many users forget to modify the changes made to the hosts document. Basically you just need to comment out the block in the hosts file as described here to resolve the 3194 error, this works the same in Mac OS X and Windows. Thanks for that – but how about telling me how to downgrade from MacOS 10.9.x to 10.8.x? That downgrade has been widely covered, including here. You need to rename the zip file to .IPSW or this will not work. 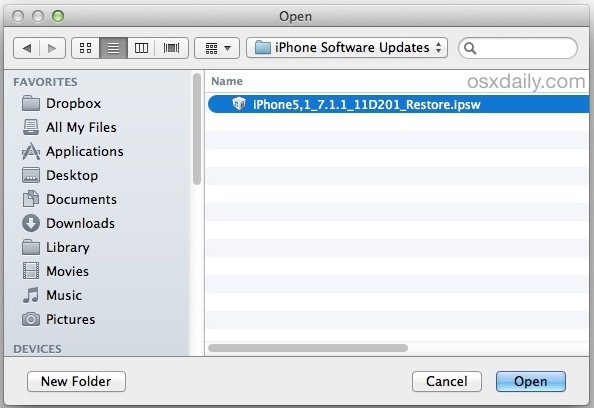 Can I downgrade iOS 8 Beta to iOS 7.0 or 7.0.4 using IPSW? Anyone else seen problems with unlocking old backups of iPhone? My password is 25 characters long mix of upper and lower and special characters…. I still need to test further but seems to be an issue. yes def having that issue. have restored to IOS7 no problem but cant restore old backups ? says “Cannot restore backup” anyone have any advice ? YOU NEED TO RENAME THE ZIP FILE .IPSW in order for this to work. It seems they left this out of the instructions. I have an iPad 2 that’s still running iOS 6. Any chance I can get 7 onto it before it’s too late? I would keep the iPad 2 on iOS 6, but that’s me. I have an iPad 3 on iOS 6 and decided to stay there after seeing performance degradation with iOS 7 and iOS 8. I like 6 too, but many new apps are for 7 and up. The methods in this article end with the “incompatible firmware” error…am I doing something wrong or is it because I’m trying to go forward instead of backwards? 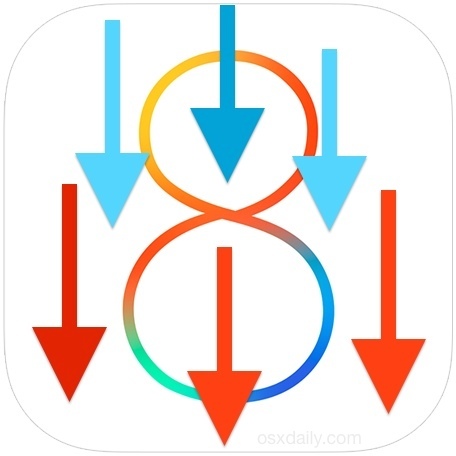 Does this method cover ios 8 beta version or iOS 8 full version? Every article about downgrading says “Go to the Summary Tab” In my version of iTunes (64 bit Windows 7 version 11.4.0.18) there is no Summary Tab. No Summary anything. I have the correct .ispw file, but no way to get it on my iPad. Any suggestions? Using OPTION+CLICK came only with a popup telling me I have the latest version. So that seems not to be working for me! Sorry to say but neither method worked. The firmware was not compatible and the recovery mode just restored it AND updated it. This didn’t work! instead it upgraded my phone to iOS 8.02!!?? So you didn’t read the instructions, didn’t see the note about how to downgrade and if it’s possible, and you upgraded to iOS 8.2, Good Job MILLS! Enjoy iOS 8.2! I bought iphone 4s its working fine . but now suddenly that password is not working. I can’t install anything. i trying to delete the mail id is asking password. Plz help me sir. Is it possible to downgrade from 8.1 to 7.1.1/2 I upgraded from 7.0.4 and I’m having wireless issues etc.